Nottinghamshire construction company, Woodhead, is celebrating after taking home a top award at Friday night’s first ever Building Communities in the East Midlands Awards. More than 350 representatives from housing providers and construction firms across the East Midlands came together on Friday 6th February to celebrate the inaugural event at the East Midlands Conference Centre, in Nottingham. 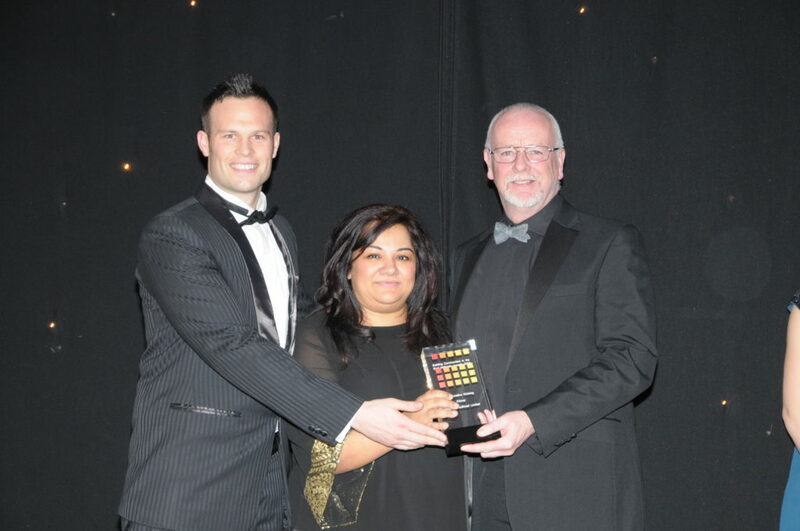 Named winner of the Collaborative Working category alongside its client, Nottingham City Homes (NCH), Woodhead achieved the accolade for its work on the Building a Better Nottingham programme. Woodhead was appointed by NCH in 2012 to take on the first phase of its Building a Better Nottingham project, which will see more than 450 new council homes built across the city over the next four years. Woodhead’s project saw 26 brand new sustainable, energy efficient family homes and bungalows, built to the Code for Sustainable Homes Level 4, on four separate former garage sites across the city. Working alongside NCH and Nottingham City Council (NCC), Woodhead completed the programme ahead of time and on budget. Each and every site achieved excellent scores from the Considerate Constructors Scheme, for their efforts in enhancing the appearance of the sites, respecting the community, protecting the environment, securing everyone’s safety and caring for the workforce. The Woodhead team also worked with NCH to put together an innovative New Home pack for tenants, complete with a DVD and information pack to explain how the various technologies in the homes work, among other key messages. Alistair Taylor, Team Leader of specialist sustainability team Woodhead Living, said: “We’re delighted to have been shortlisted in this particular category and I’m so pleased for all the team involved that we have been able to win. Woodhead’s project not only completed ahead of time and on budget, it also delivered social impact to the surrounding community, making sure over 95% of all plant labour and materials were sourced within 20 miles of each of the sites. The BCEM Awards were hosted on Friday by regional procurement consortium, Efficiency East Midlands (EEM). The not-for-profit organisation works with 31 housing providers and public sector bodies to help make efficiency savings on asset management and maintenance work programmes across the country. Event hosts, EEM, works with hundreds of contractors on its frameworks, offering free membership to any public sector organisation looking to make savings on asset management schemes. Managing Director Pete Smith decided to set up the awards to mark the work of the region’s housing organisations and contractors, both in the public and private sector. He said: “These awards celebrate the region’s commitment to building communities, creating sustainable homes and working collaboratively to support affordable rent through innovative schemes.